If there was one cookie I truly loved it was a cookie, a straight up oatmeal cookie, that my grandma made. I tried to recreate them off of her recipe many years back and they were just not the same. Maybe it was grannie’s touch, who knows. As I keep beating this one down, I am not a sweet tooth, and really do not consider myself to ever have been one. Sure, I liked Jolly Ranchers, would not turn down candy, but I would have to say that during my late teens, through today, I have not had any interest with sweets. But for whatever it is worth, these last few weeks I have wanted nothing more than sweets. I have had an ice cream sandwich, probably each day, candy, and have been making a dessert when energy allows, for my kids about once or twice a week. This recent one probably has many different names, but I’m going with the Ranger cookie recipe on this one. I want one now, they are that good. The only reason I came up with the Ranger cookie recipe is that I wanted to start purging things, you know the half open bags of things that your kids once showed interest in, and essentially toss them into a cookie mixture, bake, and serve. TRUST ME ON THESE COOKIES. You will have a hard time just eating one, and trust me they are huge. Huge in the sense that you are fitting about 6 on a cookie sheet. A large cookie sheet! See what I mean about the purge? Start by getting your mixing bowl ready, and add in the butter. Beat the butter until it is a bit light and airy, only a couple of minutes, if that. Next add in both of the sugars, continuing to mix on medium-low speed, then add in the vanilla extract, banana, and eggs. Stop your mixer, then add in the flour, baking soda, baking powder, and salt. Turn your mixer on low and slowly let that flour incorporate into the mixture. If you go back to medium speed, you are going to have flour flying out onto your countertop. Let’s not go that route! Once the flour starts to incorporate and stick with the rest of the mixture, slowly add in the frosted flakes, oats and toasted coconut. If you wanted to add in nuts, go for it. My kids are not fan of nuts, but my wife and I are, but in this case I was thinking of the kids. Lastly, add in the chocolate chips, peanut butter chips, and mix until everything is nicely blended. The trick here is chilling your dough. 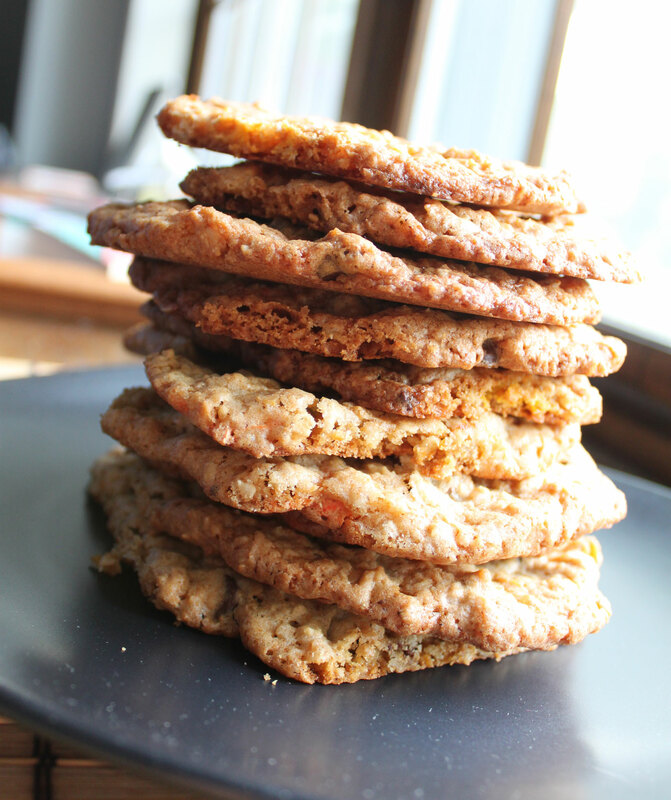 I think this lends to a crispy, yet chewy cookie in the long run, and those are my favorite type. So place the bowl of dough mixture into the refrigerator for 1 hour. About 45 minutes in, preheat your oven to 350 degrees, and line your cookie sheet with parchment paper. Have I mentioned what a fan I am of parchment paper? Take your cookie mixture out, and spoon, or use about 1/4 cup, of the cookie mixture onto the baking sheet, leaving a few inches in between each cookie. I fit about 6 on my sheet. Place into the preheated oven, and cook for about 15 minutes, or until the cookies are golden brown, and cooked in the middle. Once achieved, remove the cookie sheet from the oven, let cool for a few minutes, and carefully remove onto a cookie rack to cool. I probably ended up with 18 of these cookies, maybe more and they lasted only a couple of days. These cookies are so freaking good, and my kids questioned not once, not twice, but three times as to what was in the cookie. Believe it or not but they got most of the ingredients with the exception of the toasted coconut. Regardless, not complaints, and after about a gallon of milk and a dozen cookies later, I think I made each of those kids happy! If you are looking for a great cookie, and one that is totally satisfying, give these ranger cookies a try. Hope you enjoy! These look amazing! I am a huge fan of crunchy/chewy! Have to give them a try! I know most recipes call for it, but I have to ask….why always unsalted butter? It seems so tasteless. Thanks and glad you are feeling better! Hi Jeri! I always use unsalted butter as I never trust the salt amount that is put into the butter, plus I can control what I put into the recipe. My wife on the other hand is a huge lover of salted butter. If I know I am having bread and butter, well I don’t mind the salted type. In our house we only use high quality vanilla paste, eggs from a local farm, and Finlandia or Kerry Gold butter. The flavor difference is amazing with those high quality ingredients! When it comes to salt, flour and sugars we use generic. Do you find that there is a big difference in flavor/texture when it come to using the generic dry ingredients vs the name brand?